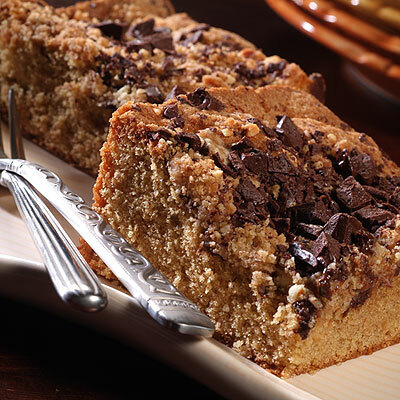 Chocolate Streusel Coffee Cake is quite delicious and simple-to-make too! You'll love the flavor combinations of coffee and chocolate. Try this for brunch! MIX flour and sugar in medium bowl; cut in butter until mixture resembles coarse crumbs. Stir in nuts. PREPARE cake mix according to package directions, substituting coffee for water. Pour batter into prepared baking pan. Sprinkle with half the chocolate, nut mixture and remaining chocolate. BAKE for 35 to 40 minutes or until wooden pick inserted in center comes out clean; cool. Cut into squares.